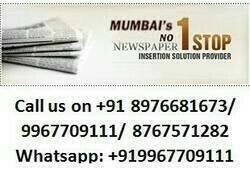 Reliable & Solutions - Service Provider of flyers distribution/insertion, leaflets distribution insertion services & leaflets distribution services in Mumbai, Maharashtra. • The proof of delivery is provided to the client in the form of pictures of the activity. The client can also be present when the inserts are being inserted in the newspaper on the day of the activity.